Undoubtedly, stainless steel is the most popular finish for kitchen appliances with black coming in 2nd place and white, well, white squeaks in right before almond and avocado – YES I SAID IT, I DID! PLEASE EXCUSE THE MINIMAL PHOTOS. 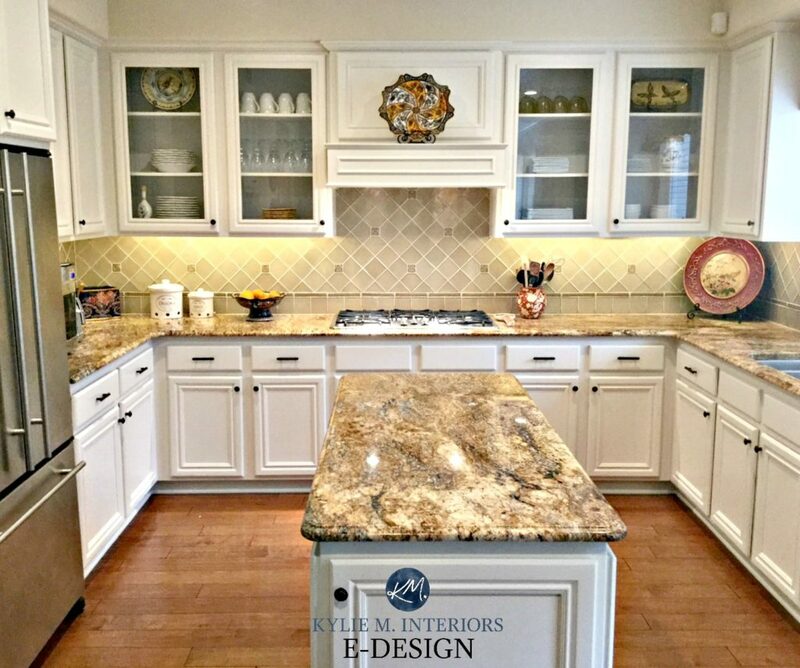 I rely 100% on my E-design clients ‘after’ photos and I don’t have any with white appliances! The INFO is still SUPER valid though, so keep reading! I will include ‘other’ photos to at least explain an idea. And while white might not be the top contender in the appliance world, personally, I like white appliances (especially the newer modern style) and the low contrast, fresh appeal they offer to kitchens. However, the problem is that white appliances can be more challenging to decorate with as the options are limited with regard to finding the ideal cabinet and countertop colours. Now first off let me start by saying that it was DAMN hard to find good photos of kitchens with white appliances (as there are a lot of ugly ones and only a few good ones). And while I don’t want to sway you entirely away from white appliances as they can look fantastic, if you are looking to purchase new appliances you will find it ‘easier’ to decorate with stainless steel, will have better resale value (generally speaking) and will have more flexibility in the long term. On the otherhand, if you have white appliances and simply want to ROCK them, then this article is for you! To make white appliances look like ‘part of the plan’ – rather than something that you can’t afford to replace right now and therefore must live with which then forces you to drink bottle upon bottle of wine – oh wait, maybe that’s just me and do I really need an excuse? To make white appliances NOT the feature of the space – one way or another, we want the focus on your beautiful cabinets, countertop, backsplash or paint colour. Why? The cool white of the appliances will make the cabinets look more gray/warm/dingy/creamy than they really are and the undertones WILL clash. You have to do ‘white’ or a ‘colour’. Your countertops will help to ground the space and give your eyes something firm to land on. It will also break up the monotony of the whites and give them something to contrast with. While the above kitchen only has a white cupboard panel on the fridge, it explains my point perfectly! 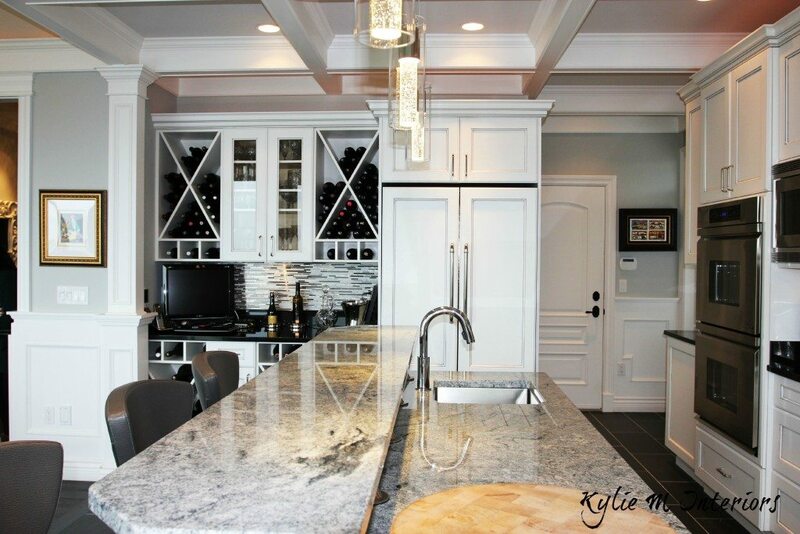 The island is marble with gray/black in it and the perimeter countertops are solid black granite. If you have a lot of black on your appliances (which a lot of the older styles do) the black countertops will help to tie these details in so that they aren’t as overwhelming. If you’re not into darker countertops, white cabinets, white appliances and white countertops can be pretty boring if you don’t add some visual firepower. Use a striking backsplash to add some contrast and personality to the space. The hardest part of decorating is the deciding – especially when you have 1000’s of choices! The best way to select what works for you is to decide which ‘look’ you like the best – high contrast or low contrast – this will at least help you narrow down the range you want to be in. Because the above kitchen cabinets are off-white, it would be a HOT MESS to pair them with white appliances – you’d have to go coloured. For those who don’t like ‘uber white’ cabinets, light coloured cabinets are a great choice as they are fresh and bright without being too white. While nothing beats white cabinets and appliances with regard to low contrast, by choosing a paint ‘colour’ that is in a lighter range you will create a low-contrast palette which will allow your appliances to blend in, rather than stand out. By painting your cabinets a colour other than white, you are already adding to the equation. You might want to keep things simple and straightforward when it comes to your countertop and backsplash with the hopes of simplifying things. Tip #2 Don’t Forget the Accents! With the creative use of artwork, pottery and everyday dishware – with a lot of white on them, you can tie your white appliances into the scheme without even trying! 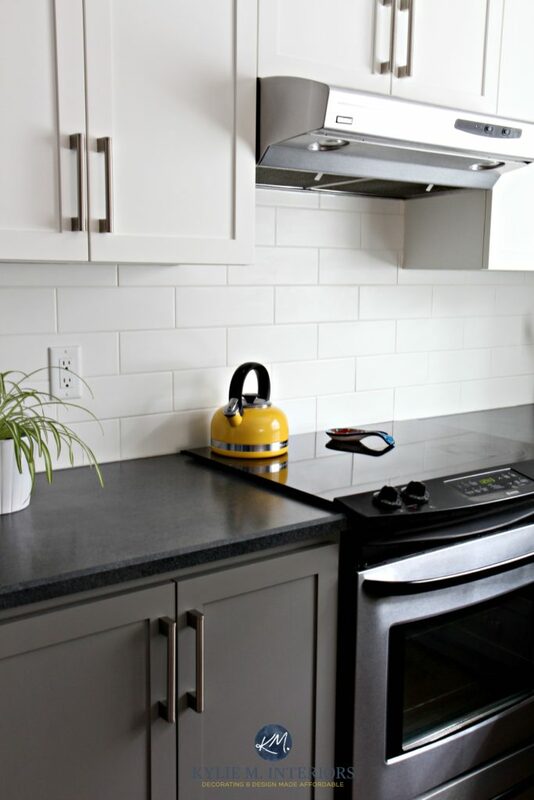 If you want to paint your cabinets a paint colour that is beyond ‘light and bright’ you’ll need to incorporate a good consistent white somewhere else in your scheme (countertops/backsplash) so that your appliances have something visual to connect to. If your appliances are the only white things in the room they will stick out like a sore thumb. If you do ALL of the cabinets dark, I guarantee you that your fridge will stick out like a sore thumb. Consider doing white uppers (real white) and dark lowers to create a happy medium. If you have a lot of white in your kitchen, you might want to consider some warm tones and textures in the room to balance things out. Wood flooring is a natural way to add warmth and texture to a room without interfering too much with colour. Ooo, I love me some butcher block countertops – especially on an island! Hi Kristen, I’m SO glad you found it helpful – you are exactly the type of homeowner I was hoping to help as I know it can be difficult to work with something that isn’t exactly what you want. I’ve found the best way to deal with these things is to embrace them and work with them, rather than against them! I LOVE my white appliances with my white cabinets. I fell for the “peer pressure” and got a stainless fridge and I hate the thing. Too hard to keep clean…and it screams “look at me”. Wish I had gone with white. I like how my white appliances don’t stand out with the white cabinets. My accents/decor get the focus- not my appliances. I have all white appliances and am starting to research our color options for cabinets. Do you by chance have a picture?? Same happened to me….I bought Whirlpool ice….a mix of steel and white….lovely….except it makes my lovely white kitchen look yellowish….struggling..
We just bought a house that has newer white appliances. The house was built in 2001 and I want to update the kitchen right off the bat. It’s oak and overwhelming to me. I was originally thinking about staining the cabinets dark, but when I found this site, I realized that you’re right. It will make the appliances stick out like a sore thumb! I think we should paint them cloud white and go with a dark counter tops and back splash. Thanks for the tips! I’m so glad the ideas and photos came in handy – these things can be tricky so it’s smart to do some research! And yes, I think going for dark countertops is wise for sure! Great article! I’m starting my kitchen project while keeping my white appliances. Affirms that what I want to do makes total sense!! The pics of the obvious bad use of white appliances gave me the laugh I needed today!! Hi Kylie! I was so happy to find your pointers on this website. I still have a very difficult kitchen that I was hoping you’d give me pointers on. I am trying to update my kitchen for under $1000…that means floors and countertops and appliances gotta stay. First I have a cream tile floor that I will eventually be replacing, but not now. I have white appliances. I have a black/grey speckled counter top. My walls are grey. I have gone round and round with what I want to do. Currently, I am considering black cabinets (so as not to have so much white against the ugly floor) on the bottom and white cabinets on the top (two-toned). I am keeping the black/grey specked counter top, with the exception of my island. I am considering a butcher block, stainless steel, or white countertop for my island. For my back splash I was thinking white with grey grout. Any thoughts you have would be so appreciated! I bought the new White Ice appliances a couple of years ago. And love them. Everyone that sees them think they are beautiful. I am so glad I went with White Ice instead of getting what everyone says you should get. Just wanted to say that not everyone loves Stainless steel. The design of the White Ice is very attractive. And do not feel my kitchen looks dated. Just because appliances are white does not mean they are 20 years old. Wanda, glad to hear you love the White Ice Series by Whirlpool! I just ordered the whole package for my kitchen remodel and am so excited! I saw them online and became obsessed with how cool they look. Not your Grandma’s white appliances at all. I am having custom cabinets painted white. I don’t want to end up with the situation the other commenter posted where my cabinets look cream. Any advice on white paint color for the cabinets? Thanks for the blog, this is exactly what I am looking for. I’m thinking of a white kitchen, including white appliances for a reno that will be a rental apartment. It is a fairly small kitchen with only one small window and no other natural light, that also serves as a hallway so will see lots of traffic. I’m thinking white cupboards with white appliances will help it appear bigger by not cutting up the space. Does that sound right? I’m thinking about the first pic, lets say ‘A’ = white with dark counters and similar subway tile backsplash, glass door upper cupboards with lighting to help it seem more open. OR maybe more like the second picture ‘B’ with the lighter counter top but a light blue/green subway tile backsplash, dark hardware. Main question – what sink?! With the goal being to make the space seem larger and brighter, I was thinking of a white farmhouse sink but if I do dark counter that won’t work, will it? Would you do stainless with ‘A’, and consider white sink for ‘B’? Or maybe an under mount and not farmhouse at all? Hi Adriana! The dark countertop can look striking, but if it’s a small kitchen I might keep things simple with an undermount sink, keeping things a bit more classic and clean! I’m so scared to pick a white for my cabinets!! I do not want them to appear yellow or old against my white appliances,… Which bm colours do you recommend? I don’t want stark… So I need an in between . Handy help would be so awesome!! Hi Trish! I try to give as much free info as I can on my blog and if that doesn’t work, sometimes it’s time for an e-design! If that interests you, I have a lot of great packages to check out that are affordable! I loved finding your post! Great info – thanks so much! I’m starting to replace appliances and want to stay with white! I’m hoping to replace my countertop soon and have oak cabinets. Should I go white or dark? Well I lean toward dark, to create a light/med/dark effect rather than ‘white or oak’. Your white is the light, your oak is the medium and your countertop is the dark! Excellent article, great options abound! With what you said in your article, if homeowners picked dark countertops would that negate the need to paint their oak cabinets white? I know some prefer white on white (on white even). If you had white appliances, oak cabinets and a blah countertop and could switch out just the colour of the cabinets or the colour of the countertop which would you choose? Where did you get that pendant light above the sink? I’m in love with it and can’t find it anywhere! Hi Nicole! Sorry, but I don’t have a photo in that blog post with a pendant light above the sink! I painted my whole house plus kitchen cabinets BM Simply White. It was SO beautiful….until my appliances arrived and made Simply White looks simply yellow. I cried. I installed a white Bosch dishwasher, a white Samsung stove, and a white Whirlpool fridge. Their blue undertone never occurred to me, and so it was the shock of my project. We just have to live with it since it cost a fortune to paint with such high quality paints. Learn from my mistake girls!